The Vallecano attended in the first goal and got the third. Lucas and Arias made Atlético fly by the wings and got their first goal with the rojiblanca. El Atlético was reunited with the victory after the knockout in the Cup. Their laterals were decisive, as well as a Koke who celebrated his 400 matches at Atlético. Oblak. It has been usual for Atlético to accommodate the game from a important stop of yours. He did it in 15 ', when he repeated over Cucho what he did to Bacca a few months ago. The Slovenian endured the one against one to the Colombian denying him a goal sung. At half an hour he responded with a header to Cucho. Arias. Another match from less to more. He started with doubts in defense, but he took the pulse of the match until he appeared with determination in a rival field. He did it with danger in the first time and decisively in the second. Griezmann found him in the area and spliced his shot to get his first goal with Atlético. Notable. Giménez. In the 12 'was providentially crossed to prevent the point-blank shot of a Rivera that he had enabled. The Uruguayan began something accelerated and with less rapport than usual with Godín. Tempered his nerves but he went round in a template on Musto that cost him the card. Godín. He fought with Enric Gallego, better above than below. The Uruguayan played with the threat of seeing the fifth yellow, but he protected himself well. 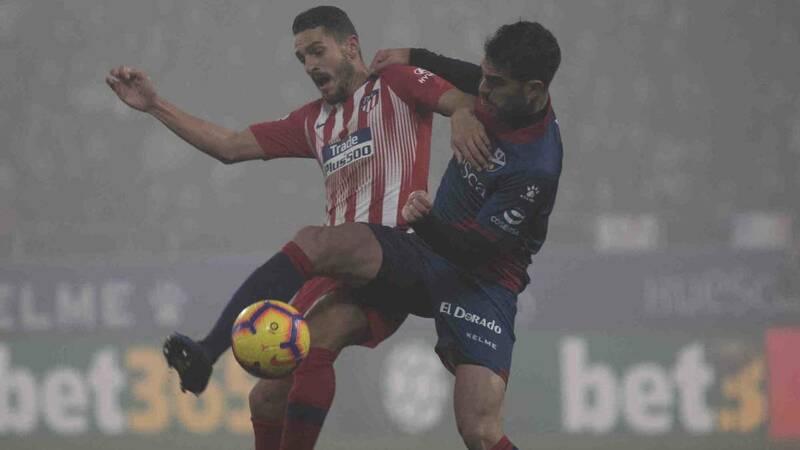 Good news for an Atlético who has lost Savic for several weeks. He completed a correct match and ended up limping. Lucas. Deep and impetuous. He came back to the starting line-up after the injury and the affair with Bayern and played an excellent game. In the 31 accompanied a long play to overtake Atlético in the small area. He arrived at the rival goal with a lot of instinct. Then, for his band, Huesca had nothing to do. Enérgico. Koke. He celebrated his match 400 with Atlético with an assist and a goal. He understood very well with Lemar in the play that ended in the goal of Lucas, who served the both on a plate. It was handled with a lot of ease in attack and adjusting in defense. An outstanding match was given to commemorate those 400 matches as colchonero. Thomas. Sereno and achiever. He played a few meters ahead of Rodrigo in attack and applied in defense. The Ghanaian did not want jokes and was serious to return solidity to the core of Atlético. Rodrigo. Rocoso. He guarded with authority the central fringe, coming out winner even when the party got involved. Al Cholo did not like some loss of his own field with the score decided, but was once again solvent. Lemar. He started very toned and eager. Calling for a ball and hoarding game. In the 18 'Correa leaked a goal ball, but inexplicably, with all the time to think, crashed the heads up in the goalkeeper. He did not accuse him and continued to enable the de-marking of his teammates. Thus began the play of the goal, finding Koke very well in space. Correa. Sharpened and decided. He found where to hurt by dropping something to the right and associating in short. There he found Lemar, leaving him alone before Santamaría. Good conductions and accelerations. He was boisterous and comfortable, as he likes to express himself. He had a good chance to score, but Santamaría answered well. The mole was the cardboard that he saw for not respecting the distance in the barrier. The next match is lost. Griezmann. He read the match very well, improving the plays and with very good short support to get closer to Correa and Lemar. Although he broke his scoring run, he played with a lot of intelligence. He assisted Arias in the Colombian goal and then hit a header on the crossbar that ended up riveting Koke. It continues in good line. Mollejo. It debuted in official party with the rojiblanca. He entered through Lemar and showed his usual self-confidence. He even scored a ride that ended with a left-footed shot that went to the post. Montero. Entering by Lucas in the final minutes. Joaquín. He jumped to the field by Lemar with time served. Official debut with the first team of Atlético.